One divide in tablet use occurs between those who prefer more of a print-like experience (often those who began as consumers of the legacy product) and those who lean toward having higher-tech features. Overall, according to the survey, mobile news consumers tilt toward preferring a print-like experience but not by much (58% prefer a print experience versus 41% higher tech). And that preference toward print tends to hold up across age, gender and other groups. 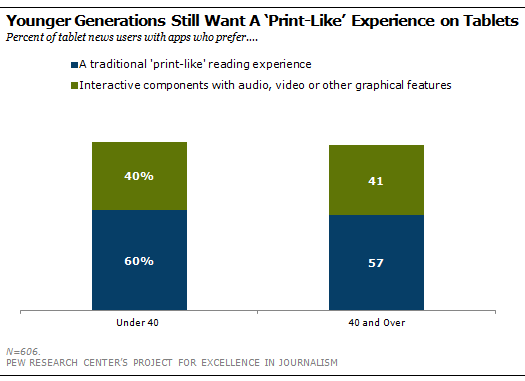 In fact, those under 40 prefer the print-like experience to the same degree as those 40 and over. The challenge for news organizations has been to meet the demands of both of these groups in the content and apps they develop. The survey also asked whether the tablet is mostly replacing news that consumers would have gotten elsewhere or is adding to the overall amount of news consumed. Again, one might expect the younger generation, whose news habits are still developing, to be adding to its news consumption more so than older generations. Actually, the reverse is true. Fully 61% of those 65 and older say the news they get on their tablet is adding to their news consumption compared with less than 45% for all other age groups. Education levels reveal even larger differences: 49% of tablet news users with less than a college education say the tablet is adding to their overall news consumption versus 36% of those with a college education or more. For this measurement, respondents were grouped as under 40 and 40 and over because the cases for a four-way age break were too small to meet statistical significance.